After a period in which it appeared to be falling behind the innovation curve, Satellite is fighting back. Recent developments are giving satellite a key role to play in combination with other technologies notably IP in a range of hybrids that broadcasters and infrastructure operators are exploring in the search for lower costs, greater flexibility and more robust redundancy provision. There is no defi ned template for designing and implementing these hybrid infrastructures, and in fact the open-ended potential offered by combining technologies is what really appeals to operators. The approaches taken can vary widely, as each operator searches for the best answer to its own operating conditions and business goals. But three very clearly defi ned aims are high on the list: these are cost effi ciencies, regionalisation capability, and redundancy provision. For many broadcasters, there is also the desire to use new technology to improve coverage, especially where terrain and population spread makes it diffi cult to reach all of the potential audience. In this respect, recent developments in satellite technology promise much. Broadcasters with large terrestrial networks always face challenges in distributing the signal to their transmitters, and while satellite can be very useful in distribution, the benefi ts of using it are offset if the broadcaster needs to implement a single frequency network (SFN). This is because SFNs require a very high degree of timing accuracy, which has not been achievable using traditional encapsulation methods for satellite. In terrestrial transmission, the DVB-T2 standard was designed to allow IP transport to the transmitter as a way of reducing costs when compared with the traditional ATM lines. When the DVB-T2 standard was adapted with the MI extension, accurate timing became possible and the timing information could be transmitted together with the accurately encapsulated content over IP. Now, with the MIS/ISI implementation, DVB-S2 in turn can encapsulate a number of streams into a separate transport stream that includes highly accurate timing. When delivered to the transmitter, this allows the broadcaster to ensure accurately timed play out, suitable for use in SFNs. 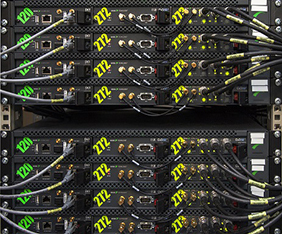 IP is also being used by some broadcasters as part of the mix for a redundancy solution, to provide either the main or backup source to some of the transmit sites. Satellite though is still the legacy method in rural areas, and even though there may be two redundant paths on the IP distribution link, having the alternative of a different technology altogether for distribution provides both fl exibility and reassurance of continued service in the case of the failure of one of the technologies. The introduction of MIS/ISI makes it a lot easier for broadcasters and networks to implement a backup strategy using both IP lines and satellite, without the risk of introducing complications arising from timing inaccuracies. Both main source and backup can be transmitted with the same timing information included. For some networks it makes sense to use a mix of technologies based on geographical criteria. Distribution via IP lines can keep costs down in the more densely populated areas, while satellite can be used exclusively to reach the more remote transmitters. For implementing regionalised coverage too, mixing the technologies allows a range of different solutions. Regionalised content can be transmitted via satellite in a side-band along with the main feed, or via IP lines while the national content is distributed by satellite. In the event of a failure in the regional content distribution technology, the national content is still available over the main distribution chain. The versatility offered by mixing satellite and IP in these ways does however come at the inevitable cost of additional complexity, so it’s important to prevent workloads for the technical staff from becoming unmanageable. While blending together disparate technologies is certainly a great way to achieve business aims, it can become a lot harder for the engineers to keep all the balls in the air. Fortunately disparate technologies can be blended into the monitoring solution too, to reduce the potential complications. A Bridge Technologies VB272/252 probe can provide a single monitoring point for the IP feed coming into transmit site, the satellite feed, and the terrestrial output of transmitter itself, and correlate all the data for SFN performance surveillance. As broadcasters search for the apparently contradictory goals of a leaner operation combined with a greater reach, well-designed technology is essential for achieving maximal capability without overkill in the machine room.